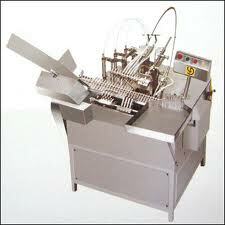 The machine built on principle of slant travel of ampoules while filling & sealing. To Take care of vide variation of ampoule neck dimensions, thickness and ovality of available Indian ampoules. The unit on SS square pipe frame and totally encompassed with SS coverings. The pendant type electrical control panel is lifted frp, machine for ease of operation and safety.